Hi its me K back with another book review. You may not have read any of my reviews before but if you are interested they are right there if you click on the tab that says K's Korner. 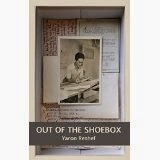 This book is called Out of the Shoebox: An Autobiographic Mystery (Historical Nonfiction story) by Yaron Reshef. You can get it on your Kindle for $3.99 here. This book is different than the other books I normally review but my mom said that I need to "broaden my horizons". The main character's story starts out with a phone call concerning a lot that his father (who is now deceased) bought many years earlier. To get the money from the sale of the lot he had to prove that his father is the true owner of it. So to do this he has to find his father's address at the time that the lot was purchased. He had to go on a big search starting with only some vague memories he had of his family history and an aunt's memoirs to help him find places that he can go to find actual documented proof of his fathers ownership. Along the way he finds some old family friends, travels to his parents home town and learns a lot about his family along the way. It was a really good non-fiction book. Ok it is the only one that I actually finished. One thing that I disliked about the book was when he added in journal entries that his aunt and he put it under the category of family and I think that it should be better being called journal entries. My next book review is due in a week so I will see you again soon. Great review, K! This book sounds interesting, but I like all of that family history stuff! Sounds like an interesting book. Thanks for sharing K. I love to read and look forward to future reviews.